As the rain arrived in the South Bay late Wednesday evening, some people saw it as a minor inconvenience while others were downright miffed about it. Employees at Queen's Trees, a Christmas tree lot in Saratoga, scrambled to get their rain jackets mere seconds after the rain started coming down. Manager Erin Reardon wasn't too thrilled. "I'm not happy about it because it slows down business, and our guys get wet, and they usually aren't prepared for the weather," she said. Reardon might be one of a few in the South Bay who feel that way. Marty Grimes, with the Santa Clara Valley Water District, said we need all the rain we can get. "We are certainly welcoming it," Grimes said. "We hope for a good amount of rain. Hopefully it doesn't cause flooding but it does help replenish our ground water and our reservoirs." Grimes said area reservoirs are at about 40 percent capacity, a little less than average. He said ground water levels have improved this year. But, in terms of the drought, California is not out of the woods yet and needs a few strong storms to build up the snowpack. "It's obviously very early in the year to know how it's going to look so we're just hopeful that it will be a good December," Grimes said. 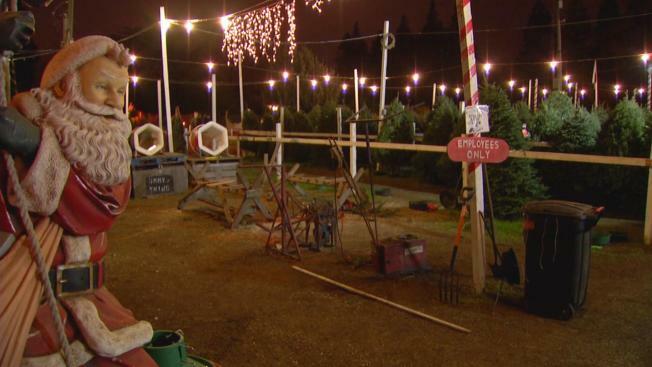 At the Christmas tree lot, the rain wasn't dampening the Mitchell family's spirits. They managed to find the perfect tree at the last second. "It just started coming down about five minutes ago," Matthew Mitchell said. "We actually got the tree just in time. It's fine. We needed the rain. I'm from the East Coast; I'm used to it. We don't get as much out here so it's fine." The brunt of the storm is expected to arrive Thursday, possibly sometime during the morning commute. It should last throughout the day and taper off by Friday, forecasters said.